Potential labor troubles and a possible economic slowdown have investors worried. 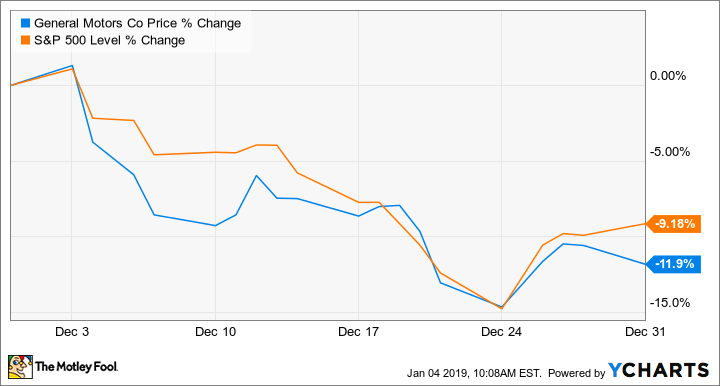 General Motors' (NYSE:GM) shares didn't have a good year in 2018, but December was especially not-so-good. According to data provided by S&P Global Market Intelligence, GM's share price fell 11.9% last month. To some extent, its shares were hit by a larger marketwide sell-off: The benchmark S&P 500 Index dropped just over 9% in December. But there was more to GM's drop than market action: A restructuring plan that GM announced in November seems to have investors worried. GM said on Nov. 26 that it intends to idle five factories in the U.S. and Canada and cut 15% of its salaried workforce. The plan is to boost GM's annual cash flow by $6 billion starting in 2020, to help finance increased investments in electric vehicles and self-driving technologies. At first, GM's move looked like a smart, proactive effort to get out in front of a slowing new-vehicle market: Shares jumped after the news was announced. But as November turned into December, larger concerns bubbled up as labor union officials in the U.S. and Canada pushed back aggressively against GM's plan. Labor trouble is never a good thing in the auto business. That's why there hasn't been much in recent years: Most strikes against automakers by the United Auto Workers (in the U.S.) and Unifor (in Canada) in the last couple of decades have been short, carefully targeted walkouts intended more to prove a point than to do serious damage. Both sides know that a serious, prolonged strike at a major assembly plant or a key parts factory would be very expensive for GM (and for the unions, too). A major strike would almost certainly put a significant dent in GM's profit, making it expensive for investors, too. GM's Lordstown factory in Ohio, which manufactures the compact Chevrolet Cruze sedan, is one of five GM assembly plants set to be idled later this year. Image source: General Motors. There's another, related concern that affected all three Detroit automakers' stocks as December unfolded: If GM's plan is intended to prepare for a slowdown, that means the company sees one on the horizon -- and automakers' profits tend to get squeezed hard when auto sales slump. GM plans a briefing for analysts and investors on Jan. 11, next Friday. It's an annual event at which GM typically previews its financial results for the prior year and releases guidance for the new year. I expect that's the plan for next Friday. I also expect that CEO Mary Barra will give us an update on GM's discussions with the unions as part of its guidance for 2019.